Eria merapiensis Schltr. 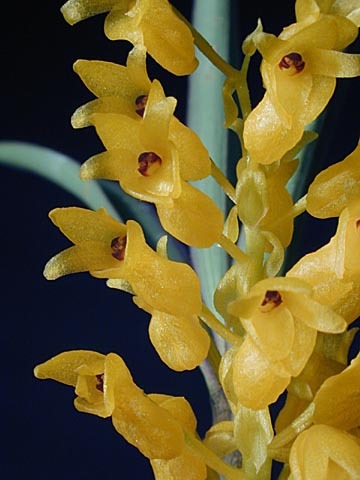 1911 SECTION Urostachya Photo courtesy of Andy's Orchids Copyright © 2002 All rights reserved. Found in west Sumatra at elevations of 820 to 2500 meters as a small sized, warm to cold growing epiphyte, terrestrial or lithophyte with stem like, basally swollen pseudobulbs carrying 4 apical, linear, narrowed both apically and basally leaves that blooms in the winter on 1 to 2, sparsly pubescent towards the apex, 2.4" [6 cm] long, 5 to 12 flowered racemose inflorescence arising from the leaf axils and has yellow floral bracts and large flowers..